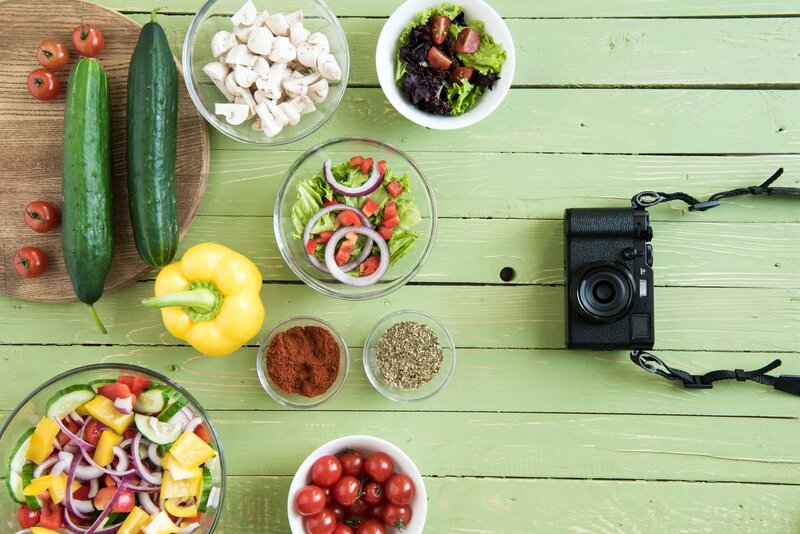 While many people will say that shutter speed, aperture, and ISO are critical for a good photo, these are not the only components to be mindful of, at least when it comes to food photography. The same can also be said for camera gear; over the last few years, camera technology has evolved to point where nearly all cameras are capable of taking amazing photos, including smartphones. In this article, we will detail a few techniques that you can use to make your food photography photos look as delicious as the food itself. Whether your interest lies in landscapes, portraits, or food photography, good lighting is essential for creating amazing stills. If your budget doesn't allow for professional lighting equipment, consider adding an ample amount of natural daylight to your shots; natural light ensures that food colors, kitchenware, and backgrounds are properly illuminated and accurately depicted. Also, you won't have to worry as much about color casts, which could introduce an unflattering orange tone to your photos. Lastly, natural light, in most cases, allows soft, diffused light to naturally highlight the subtle textures and nuances of a variety of foods. Try shooting on overcast days when possible. If the sunlight is exceptionally harsh, consider placing a semi-transparent curtain in front of windows; this will help naturally diffuse harsh light. To avoid strong color casts or harsh shadows, try to avoid shooting too to the windows in your home. If you're shooting primarily darker colored foods like chocolates, for example, a dark background will be ideal. For lighter colored foods like salads, a lighter colored or white background can place a better emphasis on the food in the shot. Wooden backgrounds are fairly universal, and they can complement nearly any food shot. These backgrounds, however, must be perfectly illuminated to achieve the best results. When it comes to good food photography, choosing the right colors can help tell a story or convey a sense of feeling. For example, earthy tones can evoke feelings of serenity and comfort. This color scheme can be created by choosing the right background and food colors. Bright, vibrant colors like those found in smoothies and ice cream, for example, can convey feelings of summer and happiness. Along with good lighting, backgrounds, and color, choosing the right angles for shots can help create more engaging photos that people will be talking about for a long time. Consider adding a mix of flat lays, close-ups, and long shots. And for good measure, throw in a few Dutch angles along with some high and low angles shots as well. One of the best things you can do to ensure your photos look amazing is making sure you're gear is ready to go. This could mean having a new/formatted memory card, fully charged batteries, and having the right lens for the job.